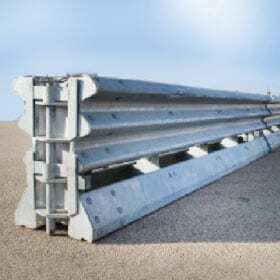 The Vulcan® Barrier is a steel longitudinal barrier made of lightweight , galvanized steel segments that can be used as a temporary or permanent median or roadside barrier. Work zone congestion can be greatly reduced by using the Vulcan Barrier to create temporary lane shifts and closures during off-peak and weekend hours. The Vulcan Barrier meets NCHRP 350 TL-3 and TL-4 test requirements as a longitudinal redirecting barrier. The Vulcan Barrier can be used in permanent and work zone applications with a variety of end treatments. The system can be deployed with multiple anchoring configurations, as a gate or free standing. Optional wheels and jacks allow the barrier to be easily moved by hand or towed short distances by a vehicle.